Get directions to the Donayre Cancer Care Center. No appointment necessary. Walk-ins welcome. Physician order is required. Results will be given to your physician, and a copy will be mailed to you. A follow up call from a registered nurse to assist in answering questions pertaining to your screening results. You are between the age of 55-80 (government payers only cover to age 77). You have smoked at least an average of one pack a day for 30 years, including current smokers and those who have quit in the last 15 years, should be screened yearly. You are over the age of 50, have smoked at least an average of one pack a day for 20 years and have at least one other risk factor listed above for lung cancer. 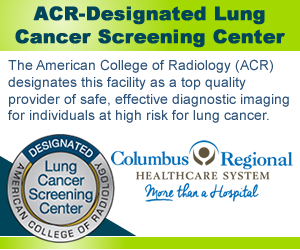 You have received a physician’s order for low dose CT for lung cancer screening. You have received occupational chemical exposure (arsenic, chromium, asbestos, nickel,cadmium, beryllium, silica,or diesel fumes). You have known radon exposure. Lung cancer has been detected in a 1st degree relative (mother, father, brother, sister). You have been diagnosed with COPD. You have a history of other cancers (lymphoma, head and neck cancers, or esophageal cancer). 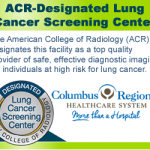 CT Lung Screening does involve radiation exposure, but the value received from an accurate diagnosis far outweighs any risk. The effective radiation dose from the procedure is 1.5mSv, which is equivalent to the radiation that an average person receives from background radiation in 1.5 years. If a nodule is detected, a follow-up CT scan may be indicated. Results from a National Lung Screening trial indicated 20% fewer deaths among current and former smokers who were screened with a low dose spiral CT, over a chest x-ray. It is estimated that over 80% of lung cancers could be cured if detected at an early stage. Lung cancer is the leading cause of cancer deaths in both men and women in the United States, more than breast, colon and prostate combined. Find out if you are a candidate at www.shouldiscreen.com.